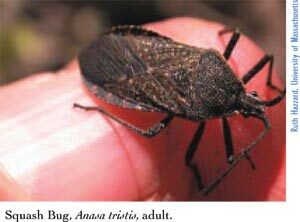 Adult squash bugs (Anasa tristis) are flat, gray-brown, and usually found on the underside of leaves or in cracks in the soil. 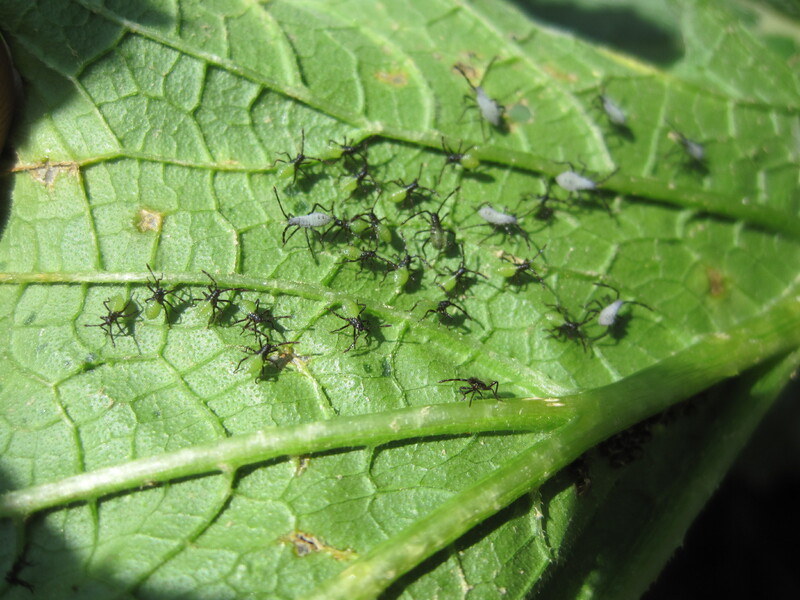 Typically squash bugs do not reach pest levels in vine crops; however, it is a pest of growing concern in New England, where growers have found high numbers and resulting crop damage in recent years. Squash bugs can cause both leaf and fruit injury if numbers are high. Adults are 0.5 to 0.75 of an inch long, flattened and grayish-brown. The edge of the abdomen is marked with alternate gold and brown patches. Adults are long-lived and lay eggs over several weeks. A single female can lay up to 250 eggs. Yellow to bronze colored eggs are laid on the underside of leaves, often in the junction of leaf veins, in an orderly cluster and hatch in 7-10 days in summer conditions. Newly hatched nymphs are light green when small, with a brown head and dark legs, and are usually found in groups. Nymphs become light gray, then darker gray to brown and more solitary as they grow and molt through five nymphal stages. Sheltered and protected areas such as field borders, woods edges, brush or wood piles provided a home for unmated adults through the winter. Adults may also over winter in crop residues in the field. 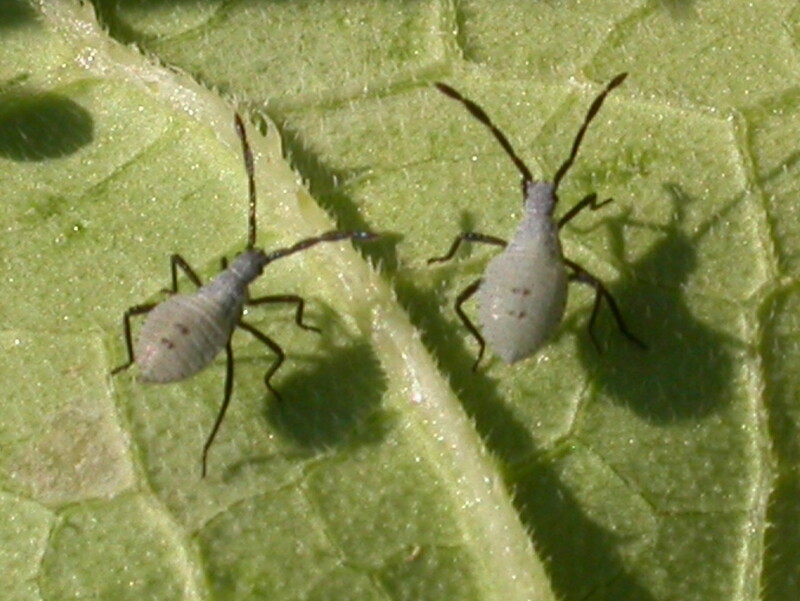 Adult squash bugs move into vine crops in June and early July to mate and lay eggs. There is one generation per year in the Northeast, and the complete life cycle requires 6-8 weeks. The most susceptible and attractive crops are yellow summer squash, zucchini, and pumpkin (Cucurbita pepo) as well as Hubbard squash (Cucurbita maxima) and other C. maxima. Watermelon, cucumber, muskmelon and butternut resist damage and provide poor food quality for adults and nymphs. Resistant varieties also include sweet cheese pumpkins (C. moshata) and royal acorn squash (C. pepo). Both adults and nymphs feed by inserting their stylets (sharp, sucking mouthparts) and sucking sap from plant tissue. This interrupts xylem transport and causes wilting in leaves, stems, and vines that are beyond the feeding site. The injury may appear as light-colored areas that later turn brown and die, symptoms that resemble bacterial wilt. Adult feeding on seedlings can cause wilting of the whole plant. 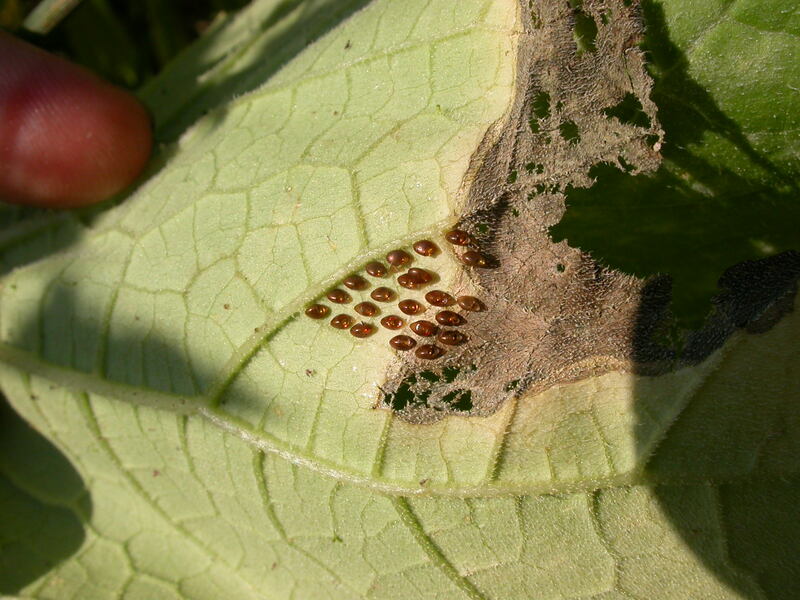 Places on the leaves where the bugs feed develop small, yellow specks that eventually turn brown due to a toxin released by the bug while it feeds. High densities and intensive feeding cause foliage to wilt, turn black and die in a condition known as “Anasa wilt”. 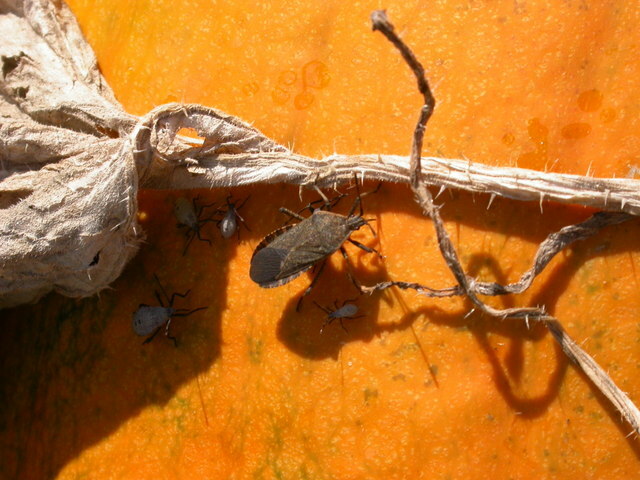 Squash bugs also feed on the fruit, causing scarring that can make the fruit unmarketable. In late summer and fall, large nymphs and new adults can damage the fruit of fall vine crops. The squash bug has also been identified as the vector of the bacterium, Serratia marcescens that causes Cucurbit Yellow Vine Decline in the United States. 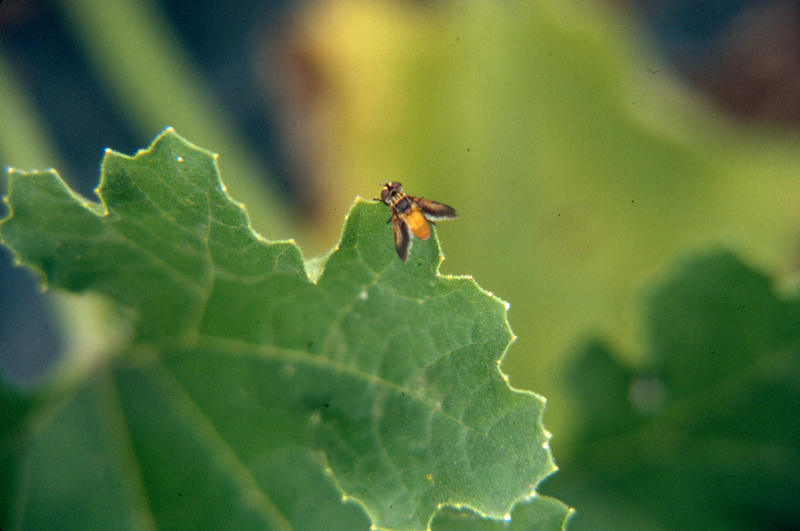 The bacterium is inoculated into a cucurbit plant by the piercing-sucking mouthparts of the squash bug and enters the phloem of the plant. Symptoms of yellow vine decline include a general yellowing of the entire vine within a two to three day period. Infected plants usually collapse completely approximately 10 to 14 days before the fruit matures. The presence of this disease was first noted in New England in 2003 but has not been confirmed since then. Scout plants from seedling to vining/flowering stage to detect adults as well as eggs and nymphs. Search upper and lower leaf surfaces and soil cracks around the plant. The population level that will be damaging to the crop will vary with the crop and its stage of growth. Controls are warranted if you see more than one egg mass per plant, especially early in the season. In watermelon, a threshold of 1 adult per plant was determined to be effective (see below). Remove crop residues and/or till field immediately after harvest to kill adults before they move to field edges seeking shelter. Keep headlands and field borders mowed and free of trash to reduce overwintering sites. Delay the arrival of adult bugs in the spring by covering early plantings with row cover. Avoid mulching with hay or straw and low- or no-till systems. We have observed higher squash bug numbers in fields in these systems; squash bugs may prefer the shelter provided by high cover crop residues. Plant Blue Hubbard squash as a perimeter trap crop. Blue Hubbard works particularly well, as it is prefered by both squash bug and cucumber beetles over vine crops. In Texas, many growers have successfully used early-planted straightneck summer squash ('Lemon Drop' or 'Hyrific') as a trap crop in the border rows of their watermelon fields to attract and control squash bugs to manage CYVD. A study conducted by Oklahoma State University found that squash bugs prefer to lay eggs on yellow straightneck and crookneck (Bonjour et al. 1990) and these cucurbits can be used effectively as a trap crop planted earlier in the season along field edges where adults will be attracted first while the main crop gets planted later and establishes. The trap crop must then receive an insecticide application or be mechanically destroyed before eggs hatch. Trap bugs in small plantings by placing some boards on the ground and checking underneath them every morning. Destroy any bugs found underneath. There is a colorful tachinid fly, Trichopoda pennipes, which lays small white eggs on the side or underside of squash bug adults and nymphs. Unfortunately, these fly eggs do not hatch and kill the squash bug in time to prevent reproduction and feeding by squash bugs. Target adults on young plants (before flowering or vining). An application made when adults are colonizing plants in June will prevent subsequent egg and larval populations. Coverage is easier at this time, and broad spectrum pyrethroids (eg bifenthrin, lambda-cyhalothrin, permethrin) or carbaryl, which are reported to be effective on adults at this stage, can be used without risk to bees on the crop. Organic materials for adults include pyrethrin. The threshold for targeting adults has been determined for watermelon crops at an average of 1 adult per plant (Dogramaci et al. 2006), but in more susceptible crops such as summer squash and zucchini, it might be appropriate to use a lower threshold (eg 1 adult/2 or more plants). Aim for coverage of underside of leaves and stems where bugs hide. Systemic furrow, drip or seed treatments and sprays for cucumber beetle at the seedling stage may also control colonizing squash bug adults. Target smaller nymphs on flowering plants. Scout for egg masses and note first arrival of nymphs. The threshold is reached at an average of one egg mass per plant and when the first nymphs are seen. Good coverage of undersides of leaves is needed. For newly laid eggs and nymphs, consider a foliar application of acetamiprid (Assail 30 SG) which has moderate toxicity to bees (lower than other neonicotinoids). Adults and larger nymphs are more difficult to control, partly because they hide in the lower canopy and near the soil. Organic options for nymphs a mixture of pyrethrin (a contact toxin) and azadiractin (an insect growth regulator, made from neem). This can be achieved by mixing separate products or with a product called Azera, which has both. This would be easier on bees than a high rate of pyrethrin alone, and would include two modes of action. Insect growth regulators work to disrupt the molting process so are useful only on immature stages. Treat late in the day when the flowers are closed to reduce risk to bees. Take note of days to harvest limits on summer squash and zucchini that are being harvested frequently. For more information on rates and products for squash bug control, check the New England Vegetable Management Guide. This also has current information on production methods (including varieties, spacing, seeding, and fertility), weed, and disease, management of squash and other Cucurbit crops. See also the IPM Guide on Diseases of Cucurbit Crops.